New Winter 2018: What do you get the fish enthusiast that has everything? 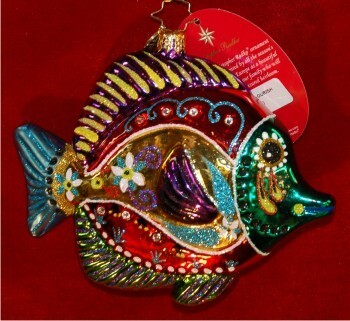 The fish with a flourish glass Christmas ornament from Radko is a wonderful choice! This glass Radko ornament is popular with snorkelers and scuba divers too, a truly unique work of art that looks fantastic wherever it is displayed throughout the year. It’s one of several glass fish ornaments in our collection, but few exude the handcrafted charm and detail of this genuine blown glass tropical fish ornament from Russell Rhodes. Sure to be a conversation starter in your home, the Radko tropical fish glass Christmas ornament is a uniquely interesting gift idea that will always be remembered.